This is about the rules of the start, in the usual position---a line set at right angles to the wind, with the Committee boat at the starboard end. Cat A, coming towards the line close-hauled, sees that this will leave a gap between him and the Committee boat. B is in luck, as he can use this gap, coming from a bit to windward before approaching the line close-hauled. Before the gun, A can luff up, hauling in tight, or going nearly head to wind to block B. This is a bad move! 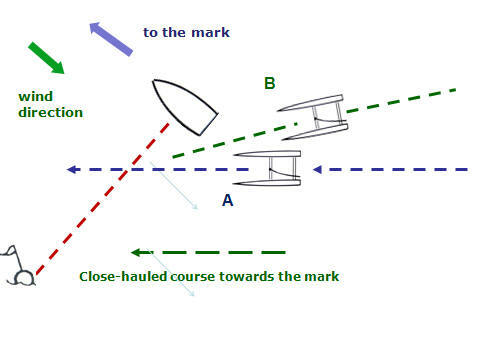 A is very likely to stall, and C will get away from both by going for boat speed further down the line. After the gun, A has to go back to the closehauled course ("proper course") . 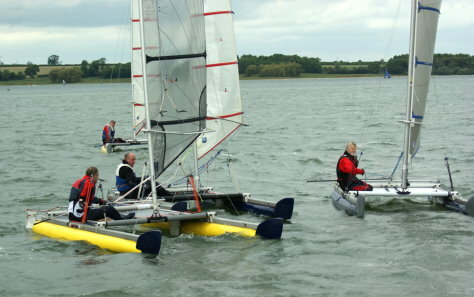 "A" in the diagram (right) is coming to the line close-hauled and has right of way. 2) The boats stream away but 531 has to tack away from the line. It is a disappointing start, but this was a good split-second decision and better than disentangling a collision and then doing a 360' turn. BELOW: A START AT BEWL IN A STRONG S.E. BREEZE. 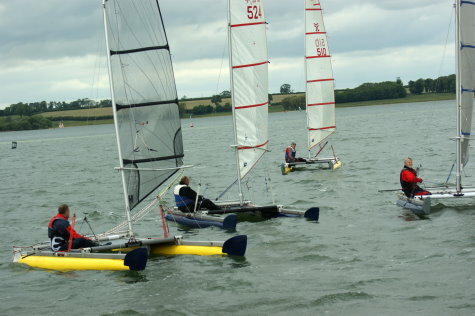 PHOTO BELOW: STALKING AT THE START, AT RUTLAND IN A LIGHT BREEZE. Before the start, John Terry, close to camera, watches Alastair (ahead) edge up to the Committee boat. Alastair plans to work slowly up to the boat, to shave past its stern on the gun, and it will be a great start if he does it. But the sails are well out and still drawing, so they are not close-hauled. You can see from John's wake that he has come down fast to turn to be below Alastair----so his aggressive plan is to leave it until about 30 seconds to the gun, then drive fast past Alastair to leeward, and then go tight-hauled up to the Committee boat, luffing Alastair hard. Alastair will have no right to room, and may be pushed onto the boat disastrously, or have to tack and circle back. 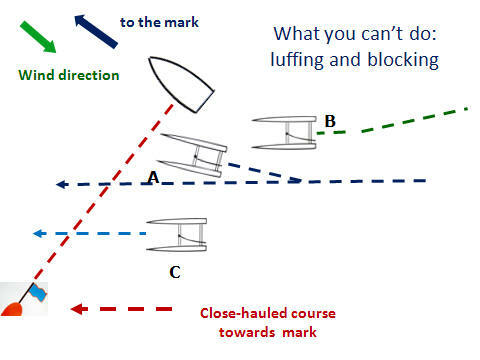 Alastair's defence is to look around, see John in this threatening position, and drop down further to leeward, when John is still further back and has no rights. Then Alastair will be close-hauled when he heads for the Committee boat, and John will struggle to get below him and then push up. In the last minute before the start, it is easy to just be looking at the approaching flag and the watch, and not notice the threats coming.